This REESE Towpower<sup></sup> Chrome Ball Mount features the built-in, patented Interlock<sup></sup> System so that only one wrench is needed to tighten the hitch ball, when used with a REESE Interlock<sup></sup> Hitch Ball. It has a 2 In. drop, 3/4 In. rise, and a 6,000 Lb. gross towing weight capacity. Upgrades the look of any tow vehicle without diminishing the durability. A standard hitch ball can also be used with this attractive Interlock<sup></sup> ball mount. Easily mount your projector to your ceiling. This universal projector mount is most commonly used in boardrooms and offices, but is also ideal for home theatre applications. It features a 3600 ball swivel, tilt capability, and can be extended between 9" and 12" from the ceiling. Included is a full set of extension arm lengths and projector mounting hardware to ensure that your installation has all the tools it needs from the get-go. We don't provide the hardware to mount to your ceiling there are just too many variables involved. Also available in a classic matte black finish. The Steelie Vent Mount Kit is a brilliant solution for keeping your smartphone secure and visible when you're in the car - any car. It consists of two simple components: 1) a Steelie Magnetic Phone Socket that adheres semi-permanently with 3M<sup></sup> VHB foam tape, either to the back of your case or to the phone itself, and 2) a versatile Steelie Vent Ball Mount that securely clips to most vehicle vents, and is just as easy to unclip, so it can be used in multiple vehicles. The Vent Ball's round shape allows radiant positioning options, so you can tilt your phone to any angle, and the strong magnetic attachment of the Steelie Phone Magnet Socket keeps your phone securely in place and where you need it. For over 55 years REESE Towpower<sup></sup> continues to pioneer the development of the simple ball mount bar. The patented Interlock<sup></sup> One Wrench Tightening System allows for one handed tightening, a breakthrough when compared to the traditional dual wrench flat hitch ball design, which required two hands, two wrenches. Protected by Metalshield, a unique, two step OEM style black paint finish. No other manufacturer offers the high level of testing that these bars are subject to. They are TESTED TOUGH! So when you're ready to tow, Road trip, let's go! REESE Towpower<sup></sup> Tested Tough! For over 55 years REESE Towpower<sup></sup> has remained the number ONE manufacturer of towing products through its continuous innovation and commitment to the highest quality standards. Our products are used by recreation enthusiasts, heavy-duty agriculture users, and even vehicle manufacturers around the world. REESE Towpower<sup></sup> includes easy-to-understand tri-lingual instructions to make installing and using your towing products simple and straightforward. Your peace of mind is our business. REESE Towpower<sup></sup> products endure testing so rigorous that our methods actually became the industry standard. No other towing products company works this hard for you. So when you're ready to tow, Road trip, let's go! REESE Towpower<sup></sup> - TESTED TOUGH! 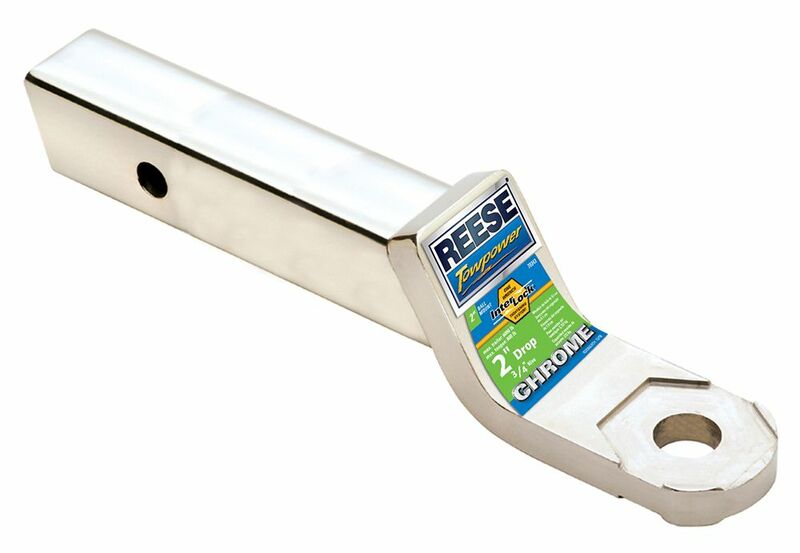 Class III Chrome Ball Mount, 2 Inch drop This REESE Towpower<sup></sup> Chrome Ball Mount features the built-in, patented Interlock<sup></sup> System so that only one wrench is needed to tighten the hitch ball, when used with a REESE Interlock<sup></sup> Hitch Ball. It has a 2 In. drop, 3/4 In. rise, and a 6,000 Lb. gross towing weight capacity. Upgrades the look of any tow vehicle without diminishing the durability. A standard hitch ball can also be used with this attractive Interlock<sup></sup> ball mount.